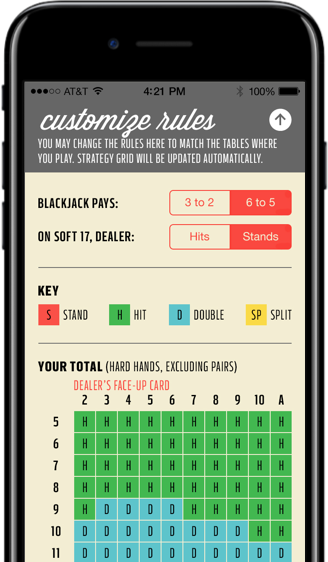 Blackjack Strategy App for iPhone and Android: Learn before you get to the table. Stop losing money. Blackjack strategy perfected. It's simple: imperfect blackjack play is money thrown away. Download Blackjack Strategy to play perfect strategy. Fast, intuitive training Our better design leads to better results more quickly. Features that improve with you Not every casino is the same, so your strategy can change. Edit the table rules to match where you play, from Las Vegas to Atlantic City. And as you improve, turn off the easy hands to perfect tricky hands. Great practice app "This is what I was looking for. Simple and easy to use with quick feedback." Excellent app! This is the one! "I don’t normally write reviews, but this is by far the best Blackjack training app in the App Store. Would highly recommend it. Lot of thought has been put into the design/interface and there’s a myriad of settings to tweak. I was able to put in 1,500 practice hands in under 3 hours on the way to Vegas." Dope "Used this app. Came up 3300 bucks the first night at the casino. 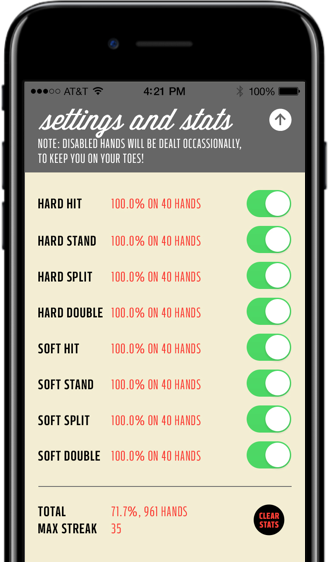 A+++"
Best Blackjack training app. "Best blackjack strategy training app out there. I’ve tried all of them and I love the user experience, design, and simplicity of it. Great job guys!" 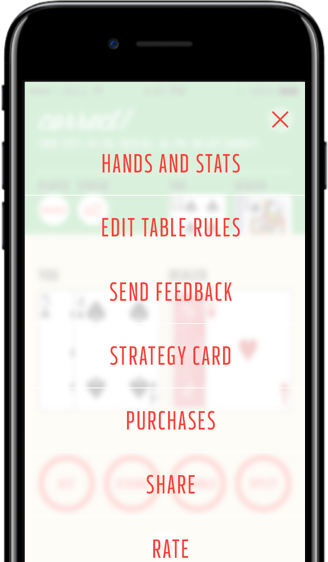 GREAT DESIGN, FOCUSED ON LEARNING HOW TO PLAY "The best Black Jack app out there. Clean, tasteful design, and the developer maintains it with reliable updates."